UNION CITY -- Oakland Bishop O'Dowd High School senior Tierra Robinson-Jones is a delightful interview. She answers questions, not just with a yes or no, but with stories, some from her childhood, some from more recent times. It's impossible not to like her. When did she first decide that she was a runner? Well that came when she was 5 or 6. She was at her grandmother's house with her older brother. When they started to walk home, a dog began chasing them, nipping at her brother's slightly torn jeans leg. Robinson-Jones turned around and outran her brother back to her grandmother's house. That alone was impressive because she was wearing flip flops. Out of breath, she told her grandmother about the big, scary dog. Oh, and although she was terrified of dogs then, she loves them now. Asked how she felt about her outstanding afternoon at the North Coast Section Bayshore Championships at James Logan on Saturday, she told about how happy she was that the meet started at 11:30 a.m. because senior ball was the night before and she was grateful for the chance to sleep in. Oh, and the heels she wore didn't mess up her running. Robinson-Jones won the 400 meters in a meet record 53.90 seconds, a full two seconds in front of Alexis Surrell of Newark Memorial, a terrific 400 runner in her own right. Robinson-Jones came back to take the 200 in 24.11, running into a headwind that seemed to be quite a bit stronger than the 1.4 meters per second officially recorded. Surrell again was second in 25.01. Robinson-Jones is counting down the days until she leaves for Texas A&M, where she plans to study business. In the meantime, she will be looking to claim the 400 at the CIF-State Championships in two weeks. 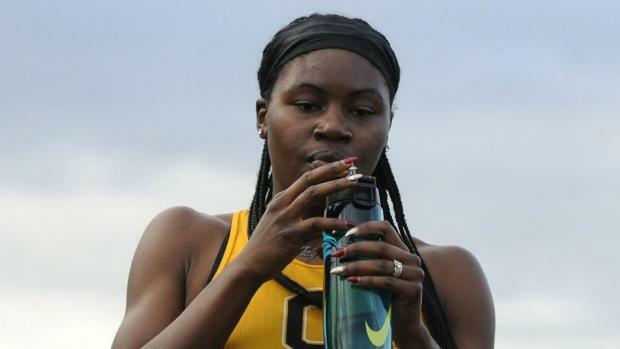 She finished second in the event last year in a then-personal best of 53.24 (she lowered that this year to 53.15 at the Sacramento Meet of Champions, a time that ranks CA #1 and US #8). She also ran a leg on the Dragons' first place 4x400 relay team at last year's State Meet (3:46.33). Maybe more impressive is that after performing so well, Robinson-Jones then raced back home so she could play with the school band during Bishop O'Dowd's graduation ceremony! She worked her way up to first clarinet before dropping orchestra to focus on track this semester. Robinson-Jones said she would like to try a double with the 200 this year. She dropped the event for the State Meet the past two years. That suggestion brought a laugh from Bishop O'Dowd coach Jamal Cooks, who has been coaching Robinson-Jones since she was 7. He explained that a coach's dilemma is figuring out how to maximize team points. Could Robinson-Jones place in the 200? Would letting Robinson-Jones try for a double end up costing the team points in the long relay? The Dragons finished fourth in the team scoring at State last year. "Part of the reason she has become so good at it is she wants to be great," Cooks said. Robinson-Jones's high school career indeed has been great. She has made the State Meet three times already, moving up the podium each year. She finished seventh as a freshman in 55.26, then took fourth as a sophomore in 54.05. She is especially proud about how she dropped her time each year and wants to get into the 52's this year, although she said she wants a "real" 52. "To me, a 52.99 is really a 53," she said, another example of how she wants to be great. It was an extremely windy day at James Logan, but several other athletes came through with big performances. 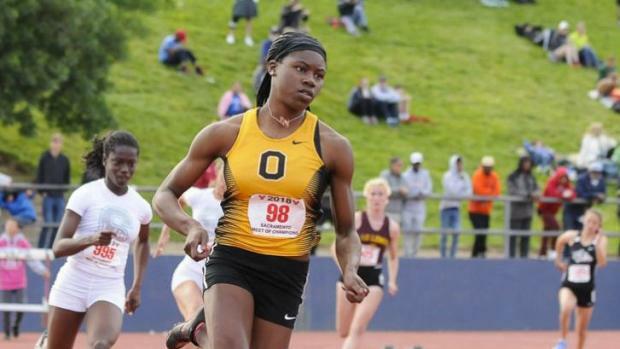 Bishop O'Dowd freshman Jazlynn Gibbs followed up her win the 100 (12.21) with a fourth in the 200 (25.51). Washington senior Nicholas Betchart won the shot put at 58-5 and took second in the discus at 145-4. James Logan won the boys championship at 73 points.